This is a book for anyone, of any size. It’s about living life in the body you have now, and making decisions about what you want in the future. Society’s thin-obsession hurts us all, this is a book about fighting back. 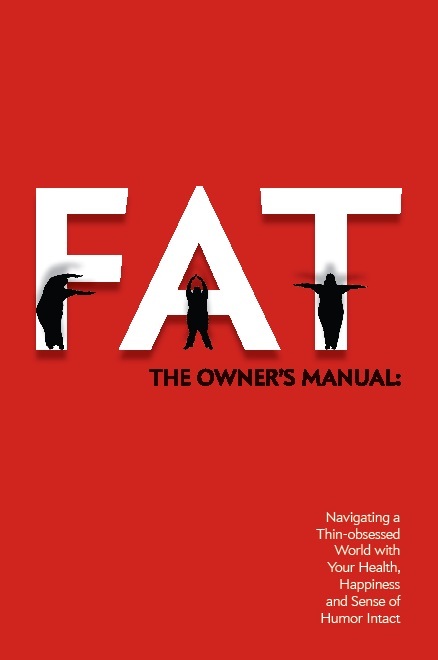 Whether you want to love your body, change your body, be a size acceptance activist, or understand and support your fat friends and family, this book provides the insights, aha moments, humor, and hard facts to help. I just bought the e-book. Can’t wait to get it! You should have the book now! Thanks for purchasing it, enjoy! Hi there, I wanted to read over some reviews before making the purchase but it seems there’s no page for the link? Just bought the book. Cant wait to read. I enjoy your blogs. I bought and read the eBook recently and was so impressed with the writing style and the incredible research and information that I’ve come back to buy the softcover as well. I love the .pdf file on my eReader, but it’s a little hard to jump around and find favorite passages. Plus, I want to do everything I can to support this project if only by funding it and becoming healthy as a result of the precepts endorsed within it. Thank you so much for such a great book! I think you’re wonderful, Ms. Chastain, and I have nothing but good wishes for you and your work. Thank you so much for the kind words and the support of my work, I’m really glad that you like the book so much!!!! Let me know if there is ever anything that I can do to support you. You already are, and we haven’t even met! Cool.